Continuing our efforts to support all-hazards Incident Management Teams (IMTs), EMSI will participate in the 2018 All-Hazards IMT Association (AHIMTA) annual Training and Education Symposium. Scheduled for December 1-6 in Hilton Head, SC, the conference will draw national leaders in all-hazards incident management from around the country. For the second year in a row, EMSI is donating a delivery of our ICS-220 Initial Response team course as part of the conference. Since piloting an updated ICS-220 course at the 2017 conference, EMSI has delivered this course several times to government and private sector clients. Enrollment is available to conference participants for a nominal registration fee, collected by the AHIMTA. Recognizing a critical ICS training shortfall, EMSI developed ICS-220 Initial Response Team, an advanced ICS training course greatly expanding on initial response management concepts, to better prepare response personnel for managing the often chaotic and dynamic initial stages of the response, with additional focus on a prolonged posture in this critical portion of an incident lifecycle. 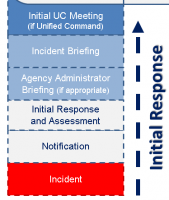 Given that approximately 95% of all incidents never leave what is often referred to as the stem of the Planning “P” (the Operational Planning Cycle), the standard NIMS All-Hazard ICS training curriculum is substantially deficient in addressing today’s complexities in preparing responders to effectively utilize ICS in the chaotic and dynamic initial response phase of an incident. While ICS-200 is a system course intended for single resources and initial action incidents, the concepts tend to be more foundational and less practical. The next level of system training, ICS-300, quickly jumps out of the initial response phase and focuses on “expanding incidents”, while placing a heavy emphasis on the proactive, managed phase of the incident, typically referred to as the cyclical part of the Planning “P”, for Type 3 (Tier 2) and beyond incidents. In addition to the course, EMSI Vice President of Operations Billy Haley will staff an exhibitor booth at the conference. The AHIMT Association serves as the voice of the All-Hazards IMT community and assists the community by coordinating the development of standards and All-Hazards incident management guidance. This is the fourth consecutive year that EMSI is participating in the AHIMTA Symposium and the third time we have donated training as part of the symposium. Since inception in 2000, EMSI has played a major role in helping government and industry clients alike, prepare, train, and respond to emergencies of any cause or size. Comprised of national and international all-risk, all-hazard response experts, EMSI’s seasoned cadre gives us a unique background and perspective in dealing with incident and responder needs at every level of government and industry, to include the international community. As a global response leader in all-risk, all-hazard, multi-discipline incidents, EMSI has a proven track record in helping the myriad of local, state, national, international, and private sector entities with their incident management and emergency management programs.